Is your automobile acting unusual or producing odd sounds? A local auto repair in Riverside, CA auto repair shop can help. 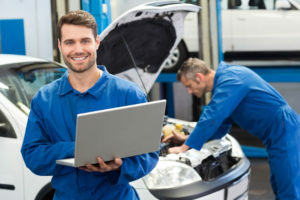 At AutoTech Service, our staff has years of experience dealing with vehicle problems throughout Riverside, CA, and we’re ready to put our skills to work for you. Your automobile is vitally important to your day-to-day life, allowing you to get to work, transport the kids, and take care of the things you need. Our efficient, honest staff is ready to help. We provide a wide variety of services, such as auto, brake, transmission and engine repair, as well as oil changes, to customers throughout the Riverside area. Our prompt, friendly and honest service has given us a well-deserved reputation as the top-notch neighborhood auto shop. We’re locally owned and operated so you know you’re getting service with a high degree of integrity and skill to back it up. We also keep quick lube bays open for a faster oil change experience, making our services even more convenient. When you need a Riverside, CA auto repair shop, AutoTech Service is the one to turn to. Whether you’re experiencing difficulty with your transmission or problems with the windshield wipers, we’re prepared to handle it all. Our highly experienced staff is ready and waiting to address your car’s problem, so call or stop by our conveniently located shop today.